Tessa Longbons | March 6, 2018. South Carolina’s annual abortion report for 2016 shows that abortion in the state is falling. Published online in November 2017 by the South Carolina Department of Health and Environmental Control, the abortion report takes up four pages of the state’s vital statistics report. Additional information is published in an online database. *Information on South Carolina’s chemical abortion totals and Planned Parenthood’s South Carolina market share is not publicly available. In 2016, there were 10,716 abortions performed on South Carolina residents (Figure 1). South Carolina reports only resident abortions and does not include abortions performed on non-resident women. 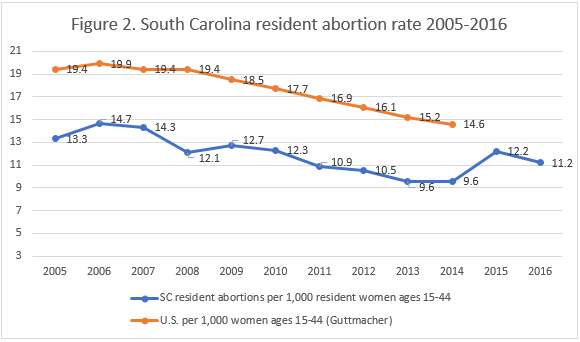 According to South Carolina’s vital statistics database, abortion data reflect abortions performed on South Carolina residents in South Carolina, North Carolina, and Georgia. 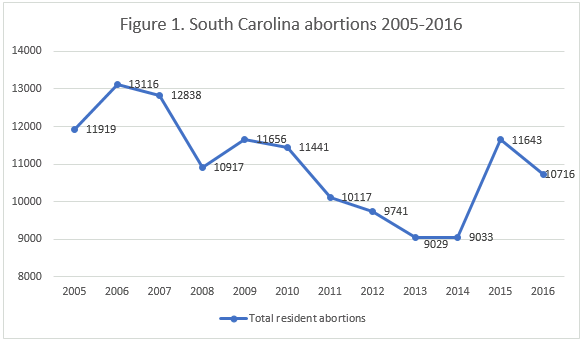 Abortions performed on South Carolina residents have fallen by eight percent since 2015 and by 29 percent since 1990, the first year with abortion data available. South Carolina does not report chemical abortion data. The state abortion rate in 2016 was 11.2 abortions per 1,000 women ages 15 to 44 (Figure 2). South Carolina’s abortion reports reveal an apparent jump in abortion during 2015; however, two of the state’s three abortion clinics were cited for 21 total violations in 2015, including neglecting to report abortions to South Carolina’s vital statistics department. It is possible that the apparent sudden rise in abortion may have been caused by required improved reporting following the violations. Sixty percent of the abortions performed on South Carolina residents in 2016 were to young women in their twenties. Nine percent of women were 19 or younger, while 30 percent were 30 or older. Forty-two percent were white. Slightly more than half of resident women had more than a high school education. An additional 37 percent reported high school as their highest level of education, while nine percent had not completed high school. Eighty-six percent were unmarried. South Carolina’s vital statistics report reveals racial disparities in the number of teen pregnancies ending in abortion. The state’s overall teen abortion rate in 2016 was 3.1 abortions per 1,000 young women ages 10 to 19. However, while the abortion rate for white teens was 2.2 abortions per 1,000 girls ages 10 to 19, the rate for teens who were black or of a different race was 4.6 abortions per 1,000 girls ages 10 to 19, more than double. In 2016, some 16 percent of the reported pregnancies of white girls ages 10 to 19 ended in abortion. By contrast, 24 percent of the reported pregnancies of teen girls who were black or a different race ended in abortion. Overall, there were 4,733 reported pregnancies experienced by South Carolina residents ages 10-19 in 2016. Seventy-nine percent ended in live birth, 20 percent ended in abortion, and less than one percent ended in a fetal death. A study on state abortion reporting by the Charlotte Lozier Institute ranked South Carolina at 28th place out of the 50 states, the District of Columbia, and New York City. The state collects, but does not publicly report, information on the state of residence of each woman undergoing abortion, any previous pregnancies, the type of procedure used, and the gestational age at which the abortion was performed. The state also collects information on the informed consent processes. South Carolina could strengthen its reporting by including summaries of the data it already collects. In addition, the state could track any complications caused by abortion and add this information to its reports. By reporting more of the data it collects, South Carolina could provide a more detailed picture of abortion in the state.